It’s been three months since the serial killer known as the “Seven of Spades” resurfaced, and the Las Vegas police aren’t any closer to catching them than they were in the beginning. For Detective Levi Abrams, the accompanying frustrating days and nightmare-filled evenings are definitely taking their toll. In stark contrast, however, his relationship with his newly-licensed PI boyfriend, Dominic Russo, is better than ever. But, if living in Vegas has taught them both anything, it’s that more than fortunes can change in an instant, and sometimes not even love is enough in the end. 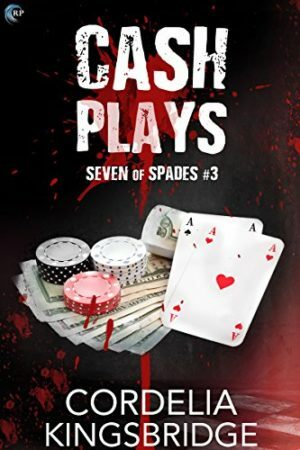 While both of the previous novels in the Seven of Spades series had tough moments, Cash Plays was rough all the way through. That’s not to say that I didn’t enjoy it, because I did. I just spent most of the story cringing over the actions of one of the main characters, the whole situation turning into a downward spiral which he never recovered from. When things start to go wrong, they go very, very wrong, and traversing the worst of it was admittedly more difficult than I thought it would be. Rather than being a deal-breaker, however, I firmly believe that the series needed the darkness, and I’m hoping that the final two stories will guide both Dominic and Levi back to an eventual happy ending. Romantically, the early chapters of Cash Plays are as sweet as any harbinger of doom could ever wish to be. Dominic and Levi are perfect for each other, and Levi’s happily awkward discomfort with the open affection is endearing. That the relationship is about to undergo an onslaught of some kind is clear, however, and watching the hits come one after the other was downright painful in a way that obligated me to continue reading to the end. Far from being a romance, though, Cash Plays builds on the already psychologically intriguing premise established in the earlier stories. Encompassing not just the main characters, but the public as well, it is an interesting exploration of the most twisted kind of hero worship and the moral dilemma inherent in vigilante justice. It’s not quite a modern-day Robin Hood with a body count, but there are some definite similarities. Though there were a couple of issues that tested my faith in the narrative, Cash Plays is a solid addition to the Seven of Spades series. And while Levi and Dominic have never had it easy, the author is relatively brutal to them here—which made the story even harder to put down. Not for anyone who likes their fiction concise and tidy, this series is going to need all five stories in order to resolve itself, and I strongly recommend that any new readers start from the very beginning. I have no idea what else might be in store for us as the series starts drawing to a close, but I can’t wait to find out.